Richard Mortimer was born at Stanton St John in 1850 and baptised there on 25 August as Richard Mortimore. He was the son of the agricultural labourer William Mortimer and his wife Emma Stevens, who were themselves born at Stanton St John and were married there on 13 October 1834. At the time of the 1851 census Richard was just a baby, living at Stanton St John with his parents William (40) and Emma (38) and his six older siblings, namely Sarah (16) and Ann (14), who were both employed at home; John (11), who was already an agricultural labourer; Mary (9) and William (7), who were at school; and Ellen (3). Also living with them was Richard’s maternal grandmother Ann Stevens, who was a pauper laundress. Richard was luckier than his brother John, as In 1861 when he was 11 he was still at school at Stanton St John. His mother was now working as a laundress as her mother had before her, and he now had two younger siblings: Frederick (6) and Charles (4). In 1871 Richard’s parents were still living in Stanton St John with two of their children and a grandson, but Richard himself was not at home. At the time of his marriage in Oxford three years later, Richard was described as a wheelwright. Elizabeth Bricknell was born in Oxford in 1852 and baptised at St Thomas’s Church on 22 February, the daughter of the boatman/coal merchant Thomas Bricknell and his wife Harriet Bridgewater, who were married at St Thomas’s Church on 7 June 1842. At the time of the 1861 census Elizabeth was aged eight and living at 27 Fisher Row with her parents and her siblings Thomas (11), Abel (6), Mary Ann (4), and Hannah (3). By the time of the 1871 census her family had moved to Ferry House in Canal Street, Jericho, and she had two more brothers: Samuel (8) and James (2). Ivy Una Brenda Daisy Mortimer (born in Oxford on 5 November 1891 and baptised at St Barnabas’s Church on 6 March 1892). Richard described himself as a carpenter in 1875. At the time of the 1881 census Richard & Elizabeth Mortimer were living at 19 Canal Street with their daughter Ellen (6), and Richard now described himself as a coal merchant and publican. In the 1891 census their address was given as Ferry House in Ferry Road (now renamed Combe Road) off Canal Street: this was presumably the house of Elizabeth’s parents, and it seems likely that Richard had inherited his father-in-law’s business. Their daughter Ellen (17) was still at home, and she now had two young brothers: (William) Thomas (7) and Firnrick (5). Richard now stated that he was just a coal merchant. Their youngest daughter Ivy was born at the end of that year. † Richard Charles Mortimer died at Ferry House at the age of 41 on 12 May 1895 and was buried at St Sepulchre’s Cemetery on 16 May (burial recorded in the parish register of St Barnabas’s Church). † Mrs Elizabeth Mortimer, née Bricknell died at 44 Juxon Street at the age of 44 (according to GRO index and parish register) and 45 (according to gravestone) on 1 August 1898 and was buried at St Sepulchre’s Cemetery on 4 August (burial recorded in the parish register of St Paul’s Church). Her four children were thus orphaned. (William) Thomas (17) joined the navy; Firnrick (13) appears to have gone to live in Islip; and Ivy (6) was taken in by the Convent of the Holy Trinity in the Woodstock Road, under the Mother Superior Marian Hughes. 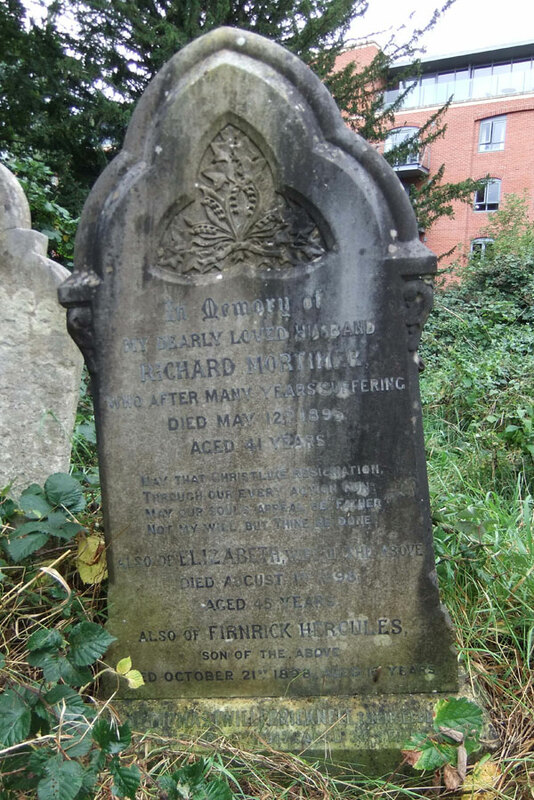 † Firnrick Hercules Mortimer died at Islip at the age of 13 on 21 October 1898 and was buried at St Sepulchre’s Cemetery on 23 October (burial recorded in the parish register of St Paul’s Church). At the time of the 1901 census. (William) Thomas Bricknell Mortimer was probably away in the navy (service records available for purchase here); and Ivy (9) was boarding in her convent. The Ellen Mortimer (24) who was working as a nurse at the Eastern Hospital, Homerton, Hackney whose birthplace was recorded as Oxford is probably his sister. Rosina M. Mortimer (born in Portsmouth in 1916, registered second quarter). (William) Thomas evidently came out of the navy but remained in Portsmouth, and at the time of the 1911 census when he was 27 he described himself as a skilled labourer and was living at 37 Brookfield Road, Kingston, Portsmouth with his wife Annie (26) and their two surviving children children (Thomas) Willie (4) and Queenie (1). They had three more children in Portsmouth between 1911 and 1916. † William Thomas Bricknell Mortimer died at 29 Donnington Road at the age of 34 on 5 November 1917 and was buried at St Sepulchre’s Cemetery on 10 November (burial recorded in the parish register of St Barnabas’s Church). Ellen Annie Mortimer (born 1874/5) was aged 36 at the time of the 1911 census and working as the housekeeper of the widower Thomas Morley (43), publican at the Plough & Anchor at 8 Great Clarendon Street. She was described as living at 30 Golden Road when on 13 July 1912 at Cowley St John Church she married the widower Albert Edward Morley. He was a drayman living at 165 Howard Street and likely to be her former employer’s relation. Ivy Una Brenda Daisy Mortimer, Mrs Hale (born 1891): see separate grave.